Day 24 - Inspired by a Book. 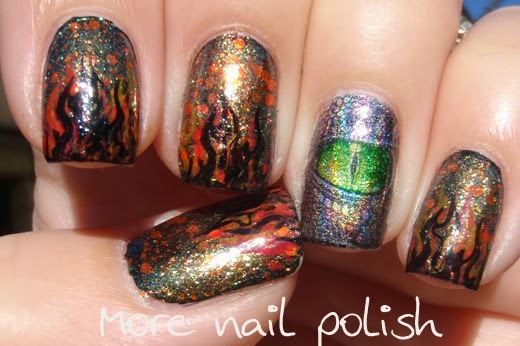 This nail art design is one that knew I wanted to do from the beginning of the challenge. I knew exactly which book I was going to choose and had the perfect polish to wear for it. 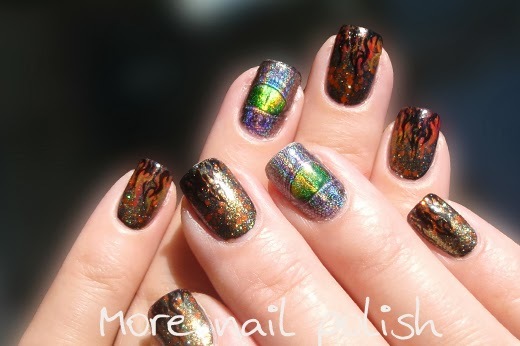 Lets look at the nail art first. The book is A Storm of Swords by George R.R. Martin. My ring finger shows a black dragon with a green eye. That represents the black dragon 'drogon'. The other fingers are Penelope Luz nail polish in Dracarys*. 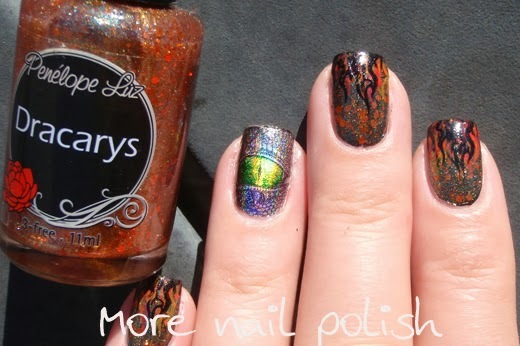 The polish has an amazing gold to green shimmer and orange glitter. I chose to wear it over black in this mani, but it can easily be worn on it's own too. 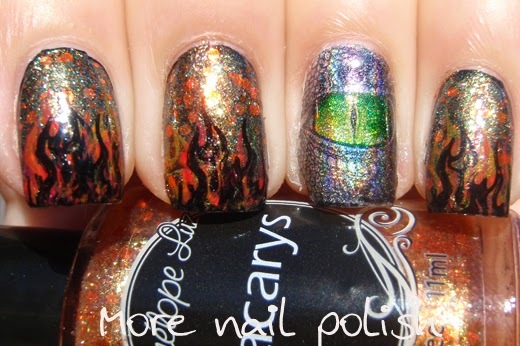 I'll show more swatches of Dracarys on it's own another day. For those unfamiliar with either A Storm of Swords or with the TV series A Game of Thrones, then Dracarys means "Dragon Fire". 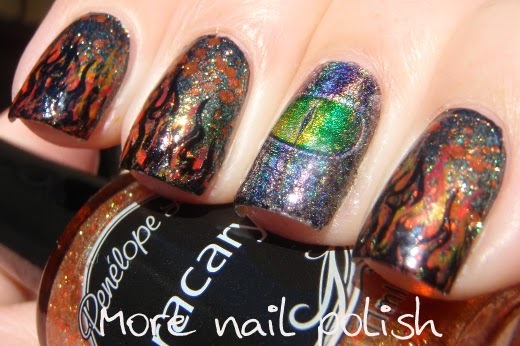 I then stamped flames on my tips in both red, orange and black. 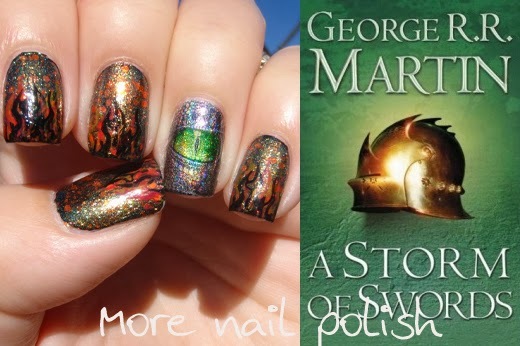 The part of the book that inspired my mani was perfectly recreated in third season of GoT in this unforgettable scene. I can not understand why I was not already your follower! 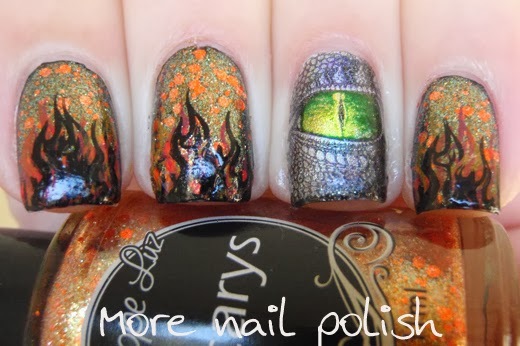 Remedy immediately ... Sincere congratulations for this beautiful nail art. It is leaving me breathless! 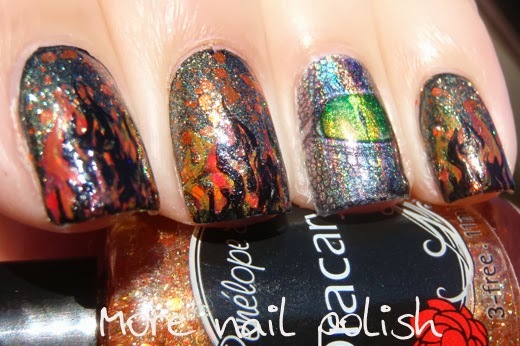 This looks amazing, especially your dragon eye!